Put God first in your thoughts and you will have a healthy Orthodox mind. At that time, Jesus arrived at the country of the Gadarenes, which is opposite Galilee. 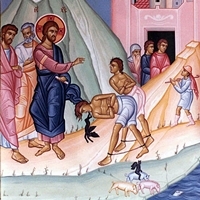 And as He stepped out on land, there met Him a man from the city who had demons; for a long time he had worn no clothes, and he lived not in a house but among the tombs. Jesus then asked him, “What is your name?” And he said, “Legion”; for many demons had entered him. And they begged Jesus not to command them to depart into the abyss. Now a large herd of swine was feeding there on the hillside; and they begged Jesus to let them enter these. So He gave them leave. Then the demons came out of the man and entered the swine, and the herd rushed down the steep bank into the lake and was drowned. And he went away, proclaiming throughout the whole city all that Jesus had done for him.